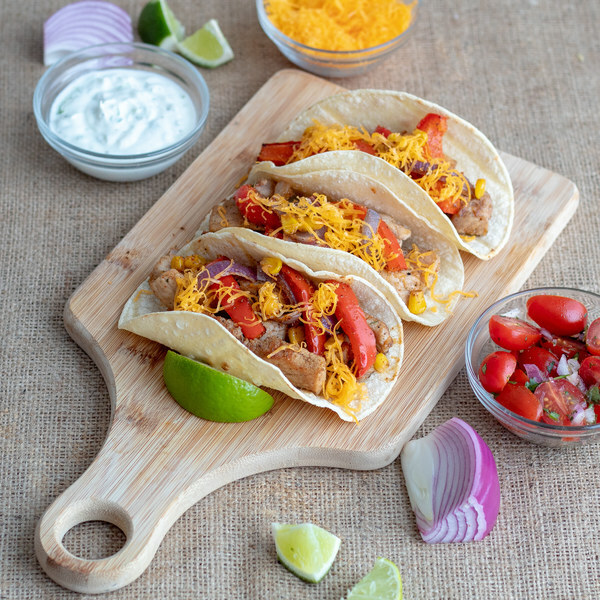 ← Grilled Pork Tacos with Roasted Veggies, Fresh Salsa, & Lime Crema. Seed and slice the bell peppers lengthwise into strips. Peel and thinly slice half of the onion. Transfer peppers, onion, and corn to a medium bowl. Toss veggies with oil and half of the spice mix. Spread out in a single layer on a baking sheet pan. Roast in the oven until the veggies have softened, 18-20 minutes. (Use this bowl again for the meat, no need to wash it!). Meanwhile, make the crema by zesting one lime into a small bowl. Combine with yogurt and season with salt and pepper; set aside. Juice the zested lime into a medium bowl; cut the remaining lime into wedges. Shave the cilantro leaves off the stems; discard the stems and mince the leaves. Add to the bowl with the lime juice. Halve the tomatoes, add to the same bowl. Mince the remaining onion and add to the medium bowl with the lime juice and tomatoes. Add oil, salt and pepper and stir to combine to make the salsa. Thinly slice the pork chops into bite-sized strips. Toss in the medium bowl you used to prepare the veggies with the remaining spice mixture. Preheat a skillet over medium-high heat. Once the skillet is hot, add oil and swirl to coat the bottom. Add the pork, cook, stirring occasionally, until the pork is golden brown, 4-6 minutes. Wrap the tortillas in a damp towel and microwave until heated through, 30 to 60 seconds. To serve, divide the pork and veggies between the tortillas, top with salsa, lime crema, and cheese. Garnish with lime wedges and enjoy!